Testo refrigeration system analyzers (RSA) are high performance instruments that accurately perform temperature and pressure measurements in seconds. These instruments provide fast, real-time superheat and subcooling readings for 39+ profiles in real-time. 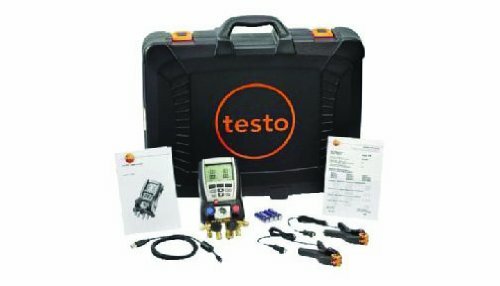 Built rugged for the field, testo RSAs give you the accuracy and repeatability you’ve come to expect from testo. Performance, value and speed cool. Real-time superheat and subcooling readings. Simultaneous digital readout of temperatures and pressures. Pipe clamp temperature probe (0.2 - 2.5" diameter). Built-in magnifying sight glass. Two NTC temperature probe inputs. Fast response time. Compact design for easeof-use transport and setup. Large easy to read back-lit display. Hardened housing that protects the analyzer. Ambient temperature and barometric pressure compensated. Rugged case. Aluminum valve block. Temperature compensated tightness test. Surface temperature compensation factor. Heat pump mode. 40 refrigerant profiles included, can be customer-updated via EasyKool software. Direct printout on site with testo wireless fast printer. Digital vacuum sensor for readings down to 80 microns. Operating temperature: 14 to 122 degree F. Storage temperature: -4 to 140 degree F. Battery life: approximate 40 hr (w/o illumination). Pressure media: CFC, HFC, N, H2O, CO2. Pressure measuring range: -14.7 to 725 psi. Pressure accuracy (at 72 degree F): +/-0.75 percent fs (+/-1 digit). Pressure resolution: 0.1 psi/0.01 bar. Measuring range: -58 to 302 degree F. Temp. accuracy (at 72 degree F): +/-1 degree F (+/- 1 digit). Temperature resolution: 0.1 degree F , 0.1 degree C. Probe connections: 2x plug-in (NTC). Refrigerants: 40. Printer: IR printer. Data store in instrument: Up to 72 hrs recording. Optional software: EasyKool. Measures 5-1/2" length by 3" width by 11" height.